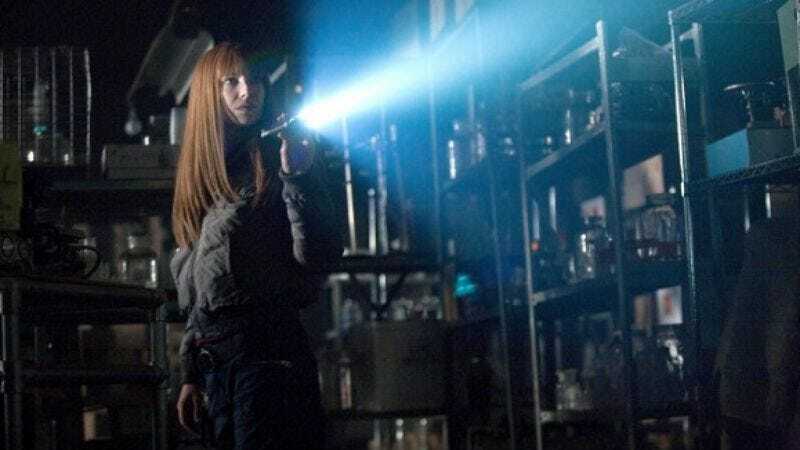 After last week’s semi-misfire, it was reassuring to see Fringe back in good form this week, with a creepy case, a great villain, and a pertinent plot twist. And of course, as always, it’s fun to spend time on Earth-2, a world that hasn’t let its horrible bouts of blight get its spirits down. Then again, who could be bummed on a planet with airships? “Immortality” was a good episode for blimpheads, with one awe-inspiring shot of an airship passing over the camera and multiple scenes set in the Empire Docking Station. It’s there where Olivia meets her beau Frank, who’s back from North Texas and ready to reconnect with his lady. He’s been a little concerned because when he called Olivia while he was away she sounded “distant… not like yourself.” (Which, y’know, she wasn’t.) But maybe it’s the romance of the skies, or maybe it’s that absence makes the heart go fonder, but after one night back together, Frank is mooning about how much he missed watching Olivia get dressed in the morning, and he’s talking about the two of them grabbing an airship down to Annapolis for a few days. But there’s an obstacle in their way. While Frank and Olivia were playing cutesy “Do I know you?” games at EDS, another man was sitting at the station bar, repeating Samuel Clemens’ famous quote about how everyone talks about the weather but no one does anything about it. The man’s name is Dr. Anton Silva, and he does plan to do something. He’s on the path to a vaccine to protect against the avian flu—a vaccine that would’ve saved millions during the last outbreak on Earth-2—but he’s been stymied in his research because he needs a certain type of beetle that disappeared when all the sheep died off in 2001. So he’s bringing the bug back, through a process that involves slipping unsuspecting strangers a spiked drink, then letting the little critters hatch inside his victims’ convulsing, vomiting bodies. Fringe Division tracks down Silva smartly, first by using their house entomologist Mona Foster to isolate the species of beetle, then by issuing a Fringe Alert (as suggested by Astrid) to get the citizenry to pass along any info they might have about bug-obsessed neighbors. Once they get Silva’s name and learn more about his research, they speculate on what kind of equipment he’d need to conduct his experiments, which leads them to his lab. But everything goes hinky when Olivia and Lincoln show up at Silva’s. She gets spooked by a baboon and falls through a rickety floor into the main lab, where loose bugs crawl all over her body until Silva pulls her up and ties her to a chair. Meanwhile, Linc gets stuck in a freezer with no comm signal, where he surely dreams about those happier days when he was on fire. “Immortality” is a good episode for Linc fans as well. We get to see him grappling with his insecurity as the replacement for Broyles—insecurity not helped by Charlie’s unwillingness to treat his old buddy with the deference due a boss—and we get to see him make tentative advances towards Olivia, to see if she’s really as committed to Frank as she claims to be. In fact, when Frank comes to Lincoln and tells him that he’s planning to propose to Olivia, Linc immediately spills the secret to her, just to gauge her reaction. She reveals nothing, though later, after Frank proposes, and she says yes, Olivia tells Linc about it. He claims to be happy if she’s happy. So all of that is in the air as Lincoln escapes the freezer and frees Olivia, right as she’s doubled-over and puking on the floor. Frank and Charlie rush in as well, and Frank hustles Olivia to an ambulance, promising to treat her with an anti-parasitic that will kill any bugs inside of her (though the process won’t be pretty). Meanwhile, Linc and Charlie play bad-cop/bad-cop with Silva, threatening to beat the crap out of him if he doesn’t tell them how to fix Olivia. Silva’s already given his big speech about how the most brilliant scientists sacrifice human lives for the greater good, and how “the world changed and robbed me of my legacy,” so after some token resistance, he comes clean and tells them that Olivia is not the final host. Silva chose to sacrifice himself instead. “Make sure they spell my name right,” he croaks (as he croaks). So what’s ailing Olivia? Just garden-variety morning sickness, confirmed by an ultrasound before Frank can spike her with the anti-parasitic. This would be happy news, except that Olivia’s only six weeks pregnant, and Frank’s been in North Texas longer than that. So it’s happy news only for Lincoln (who no longer has Frank to elbow aside) and for Walter Bishop. Our old foe Walternate only appears in a few scenes in “Immortality,” but in a way, he casts a shadow over the whole episode. Early on, Brandon reports that the chemicals synthesized from Ourlivia’s brain-juice (the makeshift Cortexiphan, in other words) work best on younger subjects, including one who’s developed a rudimentary telekinesis. Walternate, though, flatly refuses to experiment on children, which seems to set him apart from Walter and from Dr. Silva. He’s a mad scientist with a conscience. Except that when he hears about Fauxlivia’s little bundle of joy, he breaks into a creepy little smile, and thinks about how he can leverage his grandchild-to-be to bring his Peter back. Walternate won’t use children—unless he’s related to them. Walternate’s mistress Reiko is played by Joan Chen. These Fringe folks just love their Twin Peaks, don’t they? Loved Olivia making bug puns with Charlie. She’s such a dorky little goofball. Mona Foster crushes on Charlie because of who he is inside… a man full of spiders. Interesting tidbit from Frank, as he lays out the potential problems with getting married to Olivia: “There’s your job, and there’s my job, and then there’s my mother.” Who’s his mother? “Immortality” was written by David Wilcox and Ethan Gross (who judging by their Fringe credits seem to specialize in episodes about Earth-2 and creepy-crawlies), and directed by Brad Anderson (a man whose name in the credits is usually a mark that the episode is going to be a particularly good one). Fine work by all.